I have not seen many butterflies this year so it was fun watching this Swallowtail spiral its way around the flower clusters of an appropriately named Butterfly bush. This is an Eastern Tiger Swallowtail (Papilio glaucus), a North American native butterfly species. I believe the Buddleja upon which today’s garden visitor is feasting is Buddleja davidii ‘Adokeep’ (Adonis blue butterfly bush). One weather source gives the temperature as 88°F (with heat index it feels like 101°F), but another reporting station shows 92°F and my money is on the 92°F. Last year the actual high was 99°F. Thunderstorms are predicted for later this evening. They have been regular occurrences lately. This entry was posted in garden and tagged almanac, Buddleja davidii, Eastern Tiger Swallowtail (Papilio glaucus), garden photography, nature photography on June 28, 2013 by pbmgarden. A beautiful creature Susie. Thanks for sharing! Yes, I agree. Thanks Cathy! Really great pics! I am so jealous you have swallowtails already! Butterflies have been extremely scarce so far this year. I just planted a compact butterflybush called Adonis Blue, or Blue Adonis, I forget. It’s still pretty small. Thanks. I bought Adonis Blue and Black Knight years ago and have only one surviving. I’m not positive which one this is. I tried to ID it from pictures on the web. Probably I should remove the name. This one is 5 feet tall. Hope yours does well this year. We don’t have that many butterflies up here either, but I blame it on the birds. I thought it was just in our garden since we have so many birds around. But maybe it’s the weather; still cold for butterflies. I’m glad you have Swallowtails to enjoy now. I guess I’ll have to wait a little longer. P&B, hope you’ll have many butterflies soon. We have fewer bees this year too it seems to me. Interesting thought about the birds. We have a couple of feeders and the garden is full of birds, but about the normal amount. Have a good weekend. Over the past 3 summer seasons we have had just one Swallowtail in the garden, this year they have been here in multiple’s…it is so sweat to finally see that kind of progress. 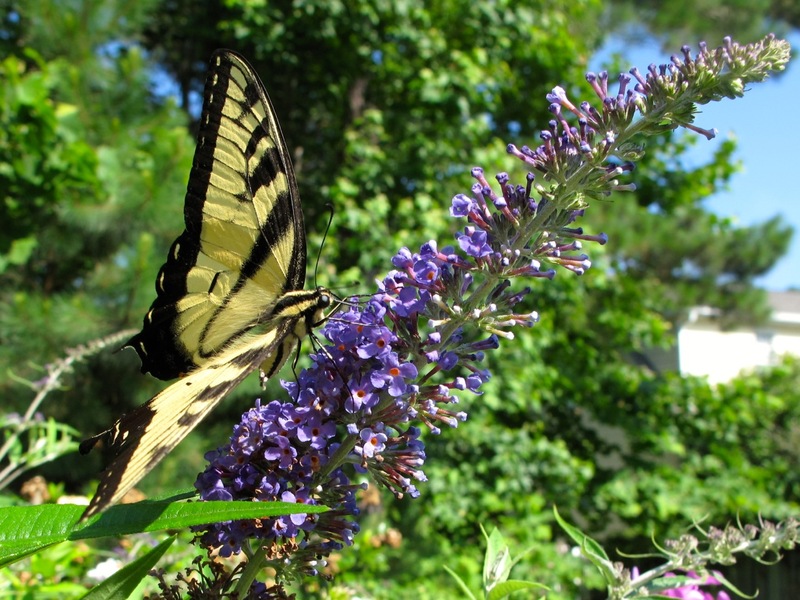 Great, that is exciting to have the Swallowtails returning to your area. Beautiful images of the swallowtails. how did you imbed the slide show? is it a new wordpress feature. Thanks, Christina, I was hoping the slideshow could help show the butterfly moving around the flower. Slideshows are not new, but they are easier now to add one by creating a Gallery and changing the Type to Slideshow. Here is quick explanation and here is a good introduction to tell you about it. Thanks. Hope you get a break in the rain soon Judy. We’re getting sunshine and storms, but it’s hard to plan anything ahead. Such a beautiful butterfly, unfortunately we don’t have swallow tails here, but quite a few varieties are now flitting round the garden. Glad you’re seeing many butterflies Pauline. So far, they seem to be scarce here. With all the rain the butterflies are scarce….I saw a few swallowtails in late May… nothing in June except cabbage whites. I saw a couple more swallowtails today Donna–survived our 5+ inches of rain yesterday. Hi Susie, I’m not seeing many butterflies this year either, for instance I haven’t spotted a swallowtail yet, although I found some of their caterpillars on my fennel. Last year I couldn’t see my fennel (they had it all!) but the garden was crowded with butterflies. I guess every year has its flush of insects and animals depending on the weather and other factors I totally ignore. I’ll be checking your blog for a slideshow to show up soon! It’s worth it to plant fennel just to attract the butterflies. Did you plant some this year as well? Hope you get some butterflies coming in soon. The poor weather here is making it difficult for butterflies. They appear each time we get a settled warm bright spell but disappear as the rain returns. A little sunshine is on the way I have heard, but it is raining now again. Did get a rainbow earlier this evening!